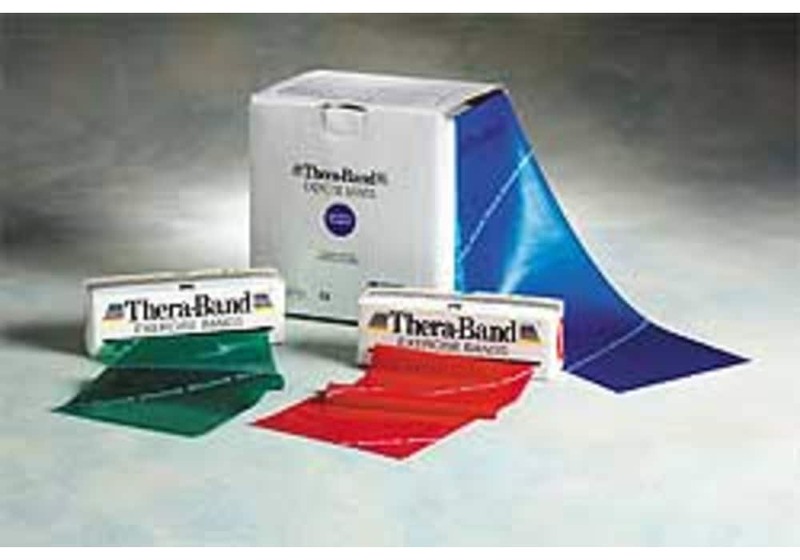 Thera Band exercise bands are color coded allowing you to easily identify the level of resistance. Thera-Band's Progressive Resistance System was designed with color-coded levels increasing in difficulty. Resistance levels are determined by the different thickness of the latex bands. Yellow being the least resistant and black being the most. These tension bands allow you to perform resistance exercises using both negative and positive force on muscles for upper and lower body conditioning. The 6-inch width evenly distributes pressure. Resistance workouts with TheraBands improve strength, range of motion and cooperation of muscle groups. Each Thera-Band comes individually packaged with one 5' resistance band per package. Lightweight and compact enough to take anywhere. Available Colors (in order of resistance - least to most): Yellow, Red, Green, Blue, Black. All bands are 5 feet long and 6 inches wide. Theraband exercise bands are color coded allowing you to easily identify the level of resistance. Thera-Band's Progressive Resistance System was designed with color-coded levels increasing in difficulty. Resistance levels are determined by the different thickness of the latex bands. Yellow being the least resistant and black being the most. 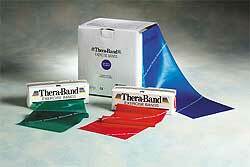 Each Thera-Band comes individually packaged with one 5' resistance band per package.